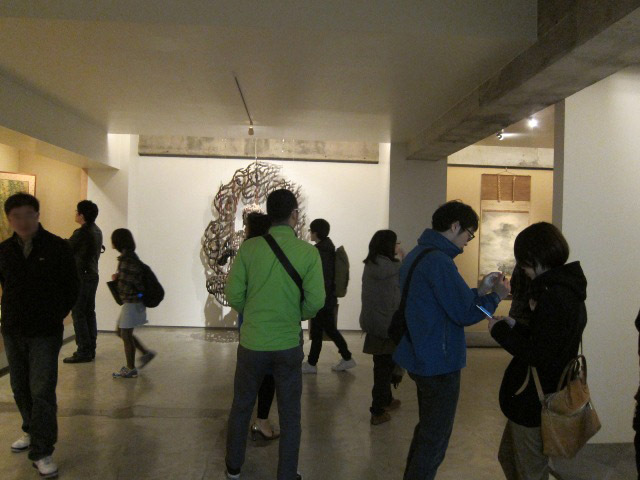 Last Saturday newspaper reporters came to the Shirokane Art Complex to cover the Shuffle exhibition, and lots of people have been coming since. Along with the "Willows of the Four Seasons" screens by Hasegawa Tōhaku (1539 - 1610), London Gallery is also displaying a painting by Maruyama Ōkyo (1733 - 1795) called "River Village in a Sudden Shower." As Yamashita Yuji, who curated this exhibition said, the viewer can really feel the wind in both of them. 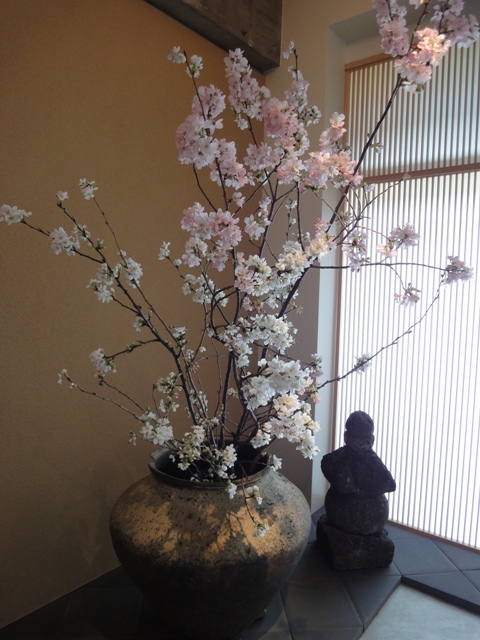 (The flowers are a kind of cherry called Ōshima sakura, which are from the opening of the show. 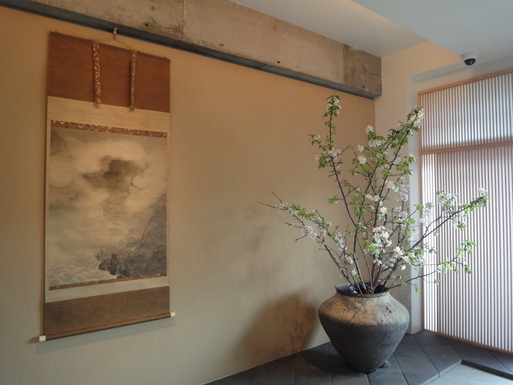 The leaves from Ōshima sakura trees are used to wrap a kind of Japanese sweet called sakura mochi, and these flowers give the gallery a fresh, springy air. 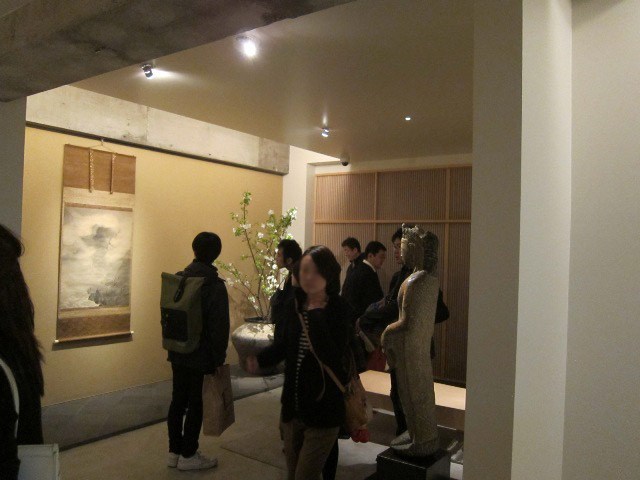 In the tokonoma there is a display unlike any other since London Gallery opened its space in the Shirokane Art Complex. 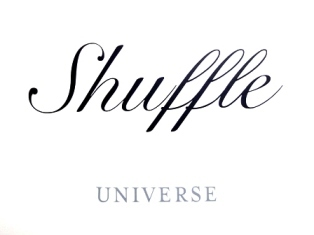 This is what we mean by "shuffle!" In fact, "Ladder" is meant to be an image representing hell. In the tokonoma next to it is a Kamakura period Jizō bosatsu sculpture from London Gallery. The bodhisattva Ksitigarbha (Jizō bosatsu in Japanese), is known to rescue people in hell, and is also a protector of children, hence the painting "Kids" in the tokonoma behind him. This installation well embodies the theme of "rescue" or "salvation" that Yamashita Yuji had in mind when curating the space. Though it was hard to belief that this kind of display would work at first, this unusual matching of pieces succeeds in creating a completely new kind of world. Unfortunately, the pictures do it no justice, so by all means please stop by and see it for yourself! 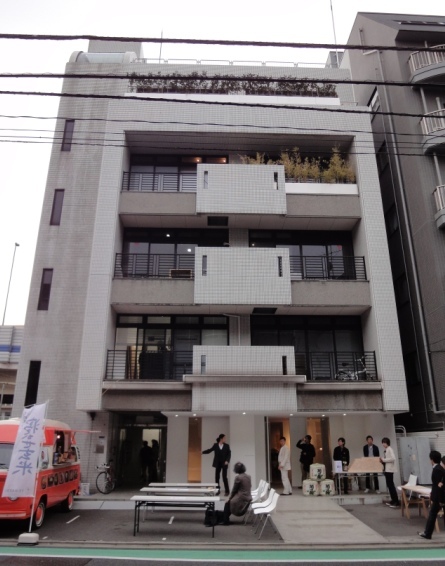 We have now entered the second week of the Shuffle exhibition here at the Shirokane Art Complex. Nearly everyone is surprised by what they see when the elevator door opens to London Gallery on the 4th floor. 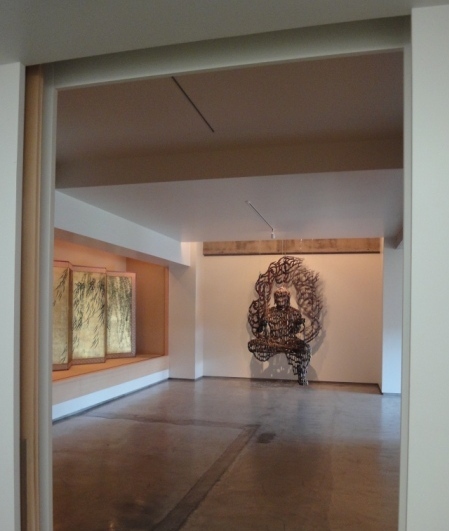 What immediately stands out is the large image of Fudō Myō'ō, made of used cardboard by artist Honbori Yuji (on loan from NANZUKA UNDERGROUND). 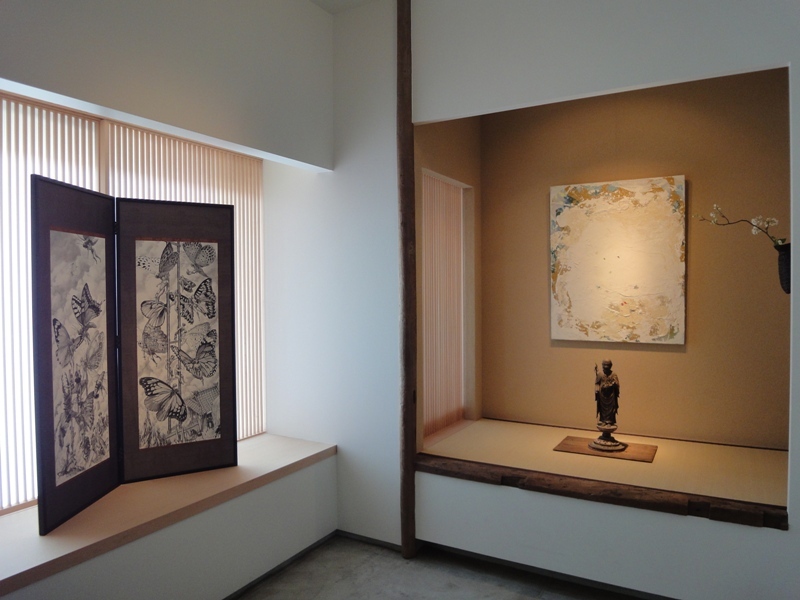 "Willows of the Four Seasons," a pair of six-fold screens by Hasegawa Tōhaku (1539 - 1610), can be seen in the space alongside it. Reading the screens from right to left, the work begins in spring, followed by summer, autumn, and finally winter with hints of snow upon the tree. Particularly with no glass between the work and the viewer, it is almost as if you can hear the leaves rustling in the wind. 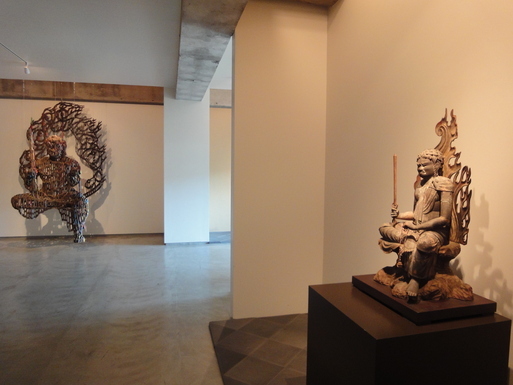 As you enter the gallery, you will find a Heian period sculpture of Fudō Myō'ō seated in the half-lotus position to your right. The large cardboard Fudō Myō'ō by Honbori Yuji was made particularly for this exhibition, and was actually based on the Heian period piece you see here. What do you think? I hope that you will take the time to stop by and have a look, and enjoy comparing the old and new Fudō Myō'ō sculptures. 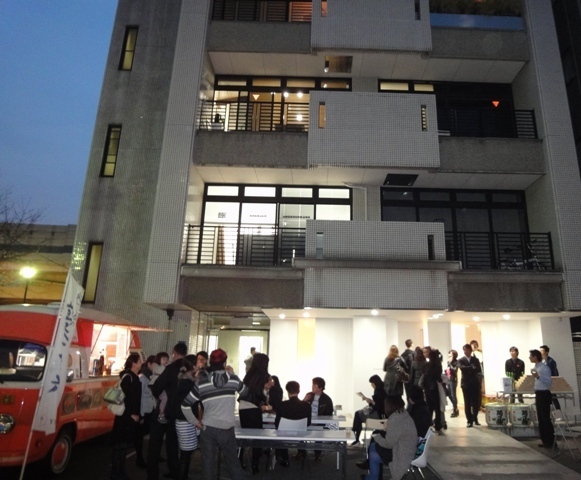 On Saturday the 2nd of April we and the other galleries in the Shirokane Art Complex celebrated our second year anniversary by holding a joint exhibition and opening the entire complex up to the public for an evening. Preparations for the event went on for the better part of the afternoon as caterers arranged tables in the parking area in the front of the building to accommodate a large number of guests. The Kikumasamune sake brewery was one of the sponsors of the event (notice the three casks of sake and stacked cups on the right side of the picture above). 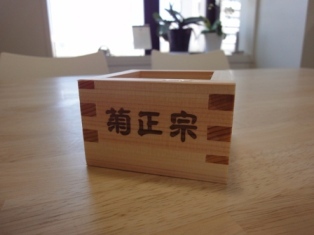 As a commemorative item for people to take home, we had these special wooden drinking boxes made, called masu, which have the maker’s name “Kikumasamune” branded on one side, and “Shirokane Art Complex” branded on the other. Made from hinoki cypress, these cups maintain a wonderful smell for quite some time after being made, and are a real pleasure to drink from. 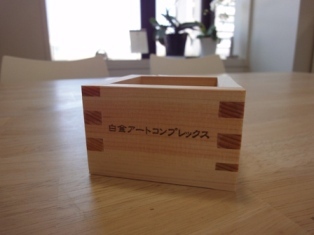 On the table alongside the drinks was a special collection box to help raise funds for the ongoing relief efforts in the Tohoku area, and we would like to express a special thanks to all those who made a contribution. Each floor had its own theme, and London Gallery’s was “Universe,” as it was illustrated here at the entrance of the gallery. The opening was well attended and people enjoyed the combination of contemporary art with more traditional/classical art, about which there is more to come (please check future blog entries for more details of the works that are on display). As the night progressed, people began to gather out front to enjoy the food and the Japanese sake that Kikumasamune provided for the event. For those who would like to visit the show, it would be best to do so soon (exhibitions close on April 30th), and please keep in mind that the fifth floor space of Hiroshi Sugimoto’s New Material Research Laboratory and the Tomoyuki Sakakida Architect and Associates Company is only open on Saturdays. The collaborative exhibition entitled Shuffle, is finally opening at the Shirokane Art Complex tomorrow. Considering the current situation in Japan after the earthquake and tsunami, there is a general mood that perhaps the opening of events such as this should be postponed for a while, though personally I feel that it is important to push forward through hardship and do the best we can. The theme given to London Gallery is "Universe," and we will have a number of different objects on display, including a Fudō Myō'ō sculpture from the Heian period as well as a modern Fudō Myō'ō made particularly for the occasion by Yuji Honbori. There will also be a Kamakura period Jizō bosatsu sculpture, as well as a number of paintings both contemporary and traditional. Now, I would like to report on the state of the cherry trees that are beginning to bloom in the small park that neighbors the Shirokane Art Complex. 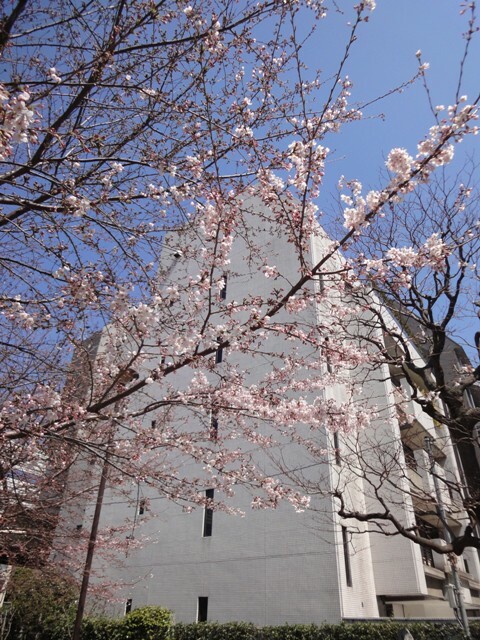 The building can be seen in the background just behind these cherry blossoms. The way it looks now, I guess that they will at about 60% capacity for tomorrow's opening. The spray of blossoms on display in the gallery, however, came to full bloom just before the opening, and petals have even begun to fall. In case you don't get a chance to come see them while they are at their peak, I hope you can enjoy them here!